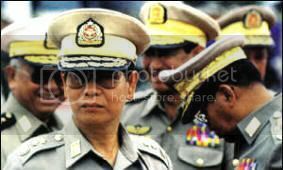 As preparations for the sham elections in Burma get into full swing, it is not difficult to notice similarities in electoral practices between the Burmese generals in uniform and Singapore’s leaders in civilian clothes. The Burmese regime is bending over backwards to stage the fraudulent elections while refusing to respect the results of the country’s polls in 1990 that led to the landslide victory for the National League for Democracy (NLD). Why reinvent the wheel, when what happened two decades ago remains unfulfilled? The same military that massacred thousands of innocent civilians, including Buddhist monks, is now pretending that everything is hunky-dory. It is an undeniable fact that the military regime holds close economic ties to Singapore – the top brass of the Burmese army are known to have parked their ill-gotten millions in Singapore’s banks, while they and their family members own properties in upmarket areas and their children go to top schools and drive flashy cars, flaunting their wealth to the envy of ordinary Singaporeans. Burmese drug lords who are banned from entering the US freely come and go in Singapore and some even have offices in the posh commercial district along Shenton Way. It is no wonder that Singapore is the third largest investor in Burma, helping to prop up the pariah regime. Singapore has even named a hybrid orchid after the Burmese prime minister, General Thein Sein. Orchids in the same Singapore Botanical Gardens were previously named after Princess Diana and Nelson Mandela. The similarities between Burma and Singapore do not stop there. The election process in Singapore is as opaque as it is in Naypyidaw, the new capital of the Burmese regime. Although Singapore claims to hold periodical elections to legitimise the rule of the People’s Action Party (PAP), the exercise itself is highly questionable. To start with, there is no independent elections commission. Only a department that comes under the Prime Minister’s Office that decides on last-minute boundary delineation, exorbitant deposits for candidates (presently $US9,900 but expected to be raised to $US11,000 in the next election), and other regular gerrymandering practices, including what is known as the Group Representation Constituencies (GRC). This so-called electoral system has led to almost half of the seats in parliament being uncontested on Nomination Day. Presently, Singapore’s ‘parliament’ has 84 MPs, of which 82 are from Lee Kuan Yew’s PAP. And that is “democratic elections” in Singapore for you! The paradox of Singapore’s elections is that sections of the electorate, some of whom are nearing their 50s, have never voted in their entire lives. This so-called anomaly is glaring in Singapore, where voting is compulsory under the Parliamentary Elections Act. With all these well-entrenched undemocratic practices, it is not surprising to even a distant observer to understand how the ruling PAP has been in power since 1959. 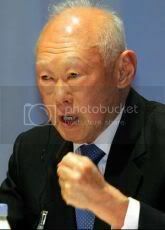 What is worse is the irrefutable reality in Singapore that one man, by the name of Lee Kuan Yew, has been in power for the last 51 years. The octogenarian Lee, who is now 87 years old, calls himself Minister Mentor in the cabinet headed by his prime minster son, Lee Hsien Loong. Compare this to the reality in Burma where the army generals have held sway since the 1962 coup, ousting the democratically elected government of U Nu. Even against this, Lee Kuan Yew’s grip on power extends longer by three years, but he continues to claim that elections in his republic are based on the Westminster model of democracy. Anyone who believes in democratic values could easily see that it is next to impossible to continue to have a one-party dominated parliament in the name of freedom and democracy. Obviously the uniformed generals are under tutelage by the authoritarian regime in Singapore, clad in civilian clothes. While the Burmese generals continue to not recognise the results of the 1990 elections, preparations are in full swing to hold yet another elections based on its 2008 constitution, aimed at hoodwinking the people. Singapore too is notorious for amending its constitution just before every general election to give a legal facade to what is clearly an illegitimate exercise. The Burmese generals also appear to have been keen and obedient students to their teacher, Singapore. Burmese intelligence agents are known to visit on a routine basis to study the latest electronic eavesdropping gadgets for their surveillance of Burmese political dissidents, including the NLD leaders. The recent announcement by NLD to boycott the army-orchestrated sham elections is the right move. How can the elections be legitimate when NLD’s leader, Daw Aung San Suu Kyi, remains under house arrest and barred from taking part? Singapore too, has a history of barring genuine opposition leaders who were daring enough to challenge, through constitutional means, the regime of Lee Kuan Yew. Victims of Lee’s political vendetta include prominent figures such as the late J B Jeyaretnam, Singapore’s former solicitor-general Mr Francis Seow (now in exile in the US), Singapore’s leading corporate lawyer Mr Tang Liang Hong (now in exile in Australia), and Dr Chee Soon Juan, who remains bankrupted and unable to stand for elections. These are well-known democrats who stood up against Lee Kuan Yew, who had openly declared in 2003 that: “If we had considered them serious political figures, we would not have kept them politically alive for so long. We could have bankrupted them earlier.” Is this not what the generals in Burma are doing while loudly proclaiming to the world that there will be “free and fair” elections in the country before the end of the year? While Singapore leaders are shedding crocodile tears and sermonizing the Burmese generals on the need for free and fair elections, is it not appropriate for them to look at their own backyard? When Singapore’s Senior Minister Goh Chok Tong met the Burmese generals, including Than Shwe, last year, he urged them not to allow the ongoing trial of Suu Kyi to affect the national reconciliation process and to make sure that the proposed elections are free and fair. It is better for Goh to take a hard look at himself in the mirror: he will then be able to see the ugly features that include a well-documented law providing for indefinite detention without trial, under which detainees are subject to regular physical and mental torture. It is also common in Singapore to prosecute opposition politicians for speaking in public and distributing flyers; laws that are no different from the Burmese junta’s. Goh Chok Tong’s “advice” is double-speak at best. What right has he got to advise the generals when the same despicable acts are committed at every election in Singapore? Are elections in Singapore free and fair in the first place? Is the media in Singapore free and pluralistic for the voters to be informed before they go to the polls to choose their representatives to parliament? Burma’s media laws are the strictest in the world, and so are Singapore’s, the most notorious being the Newspapers and Printing Presses Act that gives sweeping powers, including the appointment of editors to the 14 daily newspapers that are all under the control of the PAP government. 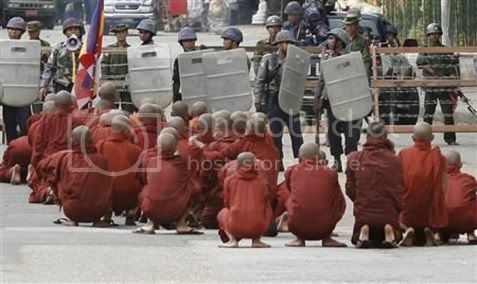 Burma is ranked 171 out of 175 countries in the recent Reporters Without Borders’ Press Freedom Index. Singapore is also in the miserable position of 133, several ranks below that of even Angola and Congo. The Singapore Press Holdings, whose chairman was a former deputy prime minister, runs all the newspapers of which its flagship daily is the Straits Times. It’s a known fact that intelligence operatives masquerade as reporters and journalists in Singapore’s media scene. The Straits Times has its equivalent in Burma, the New Light of Myanmar, which is nothing but a mouthpiece of the military regime. Similarities between the autocratic rule in Singapore and the equally notorious regime in Burma are endless. 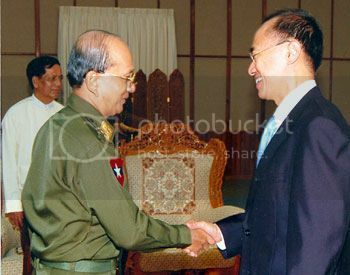 Learning from Singapore on how to perpetuate one-party rule through sham elections is a natural progression for Burma under the bloodthirsty generals. Read also: Burma’s sham elections by The Independent. Seelan Palay is an artist and activist from Singapore. He works with Free Burma Campaign Singapore and blogs here.